(All Indian Railways, PUSs, RDSO, NAIR, Directors/Training Institutes). 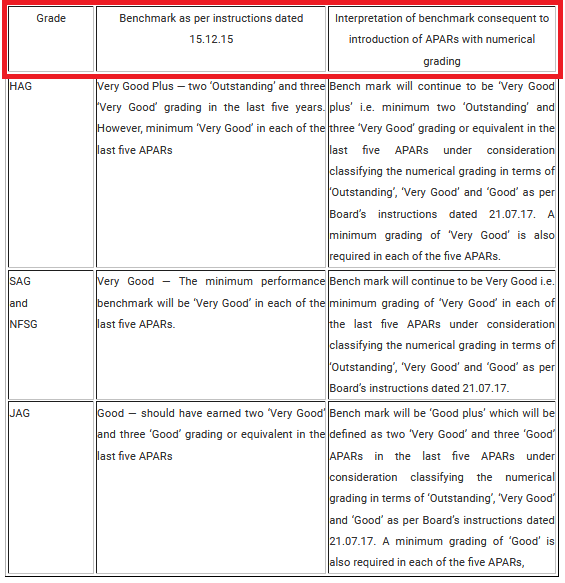 Subject : Benchmark for promotion to administrative grades in Railway Services. Reference : Board’s letter No.2017/SCC/03/09 dated 01.09.17 and 23.11.17. 2. DPC should not be guided merely by the overall grading, that may be recorded in the APARs but should make its own assessment on the basis of entries in the APARs, as at times the overall grading in a APAR may be inconsistent with the grading under various parameters or attributes. 3. Railways/PUs etc. are also advised that empanelment /promotion of officers made on the basis of instructions dated 01.09.17 need not be revisited unless the same has adversely affected their promotion. Above mentioned decision should be brought to the notice of all officers working in respective Railways/PUs/CTIs. Railways/PUs etc. are also advised that empanelment /promotion of officers made on the basis of instructions dated 01.09.17 need not be revisited unless the same has adversely affected their promotion.